The party had traveled deeper into the dense woods for over an hour before the rains let up. Then, when they chanced upon a small barren spot amongst the trees, they decided to take a break and enjoy some of the venison from the deer Jack had shot. Had Abelard perished in the violent lighting bolt attack? Or had the old alchemist's tower saved him from harm? Indeed, was it an attack? Or some experiment of his for which he needed them out of the tower? Or even a weird natural phenomena? There was no way to know . . . and none felt like returning to the tower to find out. After they ate, it chanced that Nikos spied a rounded edge protruding from the soil that seemed to gleam of bronze. When he loosened it from the earth, a hoplon was revealed. When he cried out his surprise in Krege, his native tongue, Zilwen responded in the same language. "What hast thou found, swordsman?" "A shield from my homeland, Zilwen. It looks sound, but very old." Is there magic cast on thee?" When nothing seemed to happen, Zilwen relaxed and said, "It seems safe enough. I don't believe it's magic at any rate." "So, you're a wizard then. What else haven't you told us?" asked Yobella, who'd been attracted by the spellcasting, speaking in Mergan. "I have started my studies, yes." responded Zilwen in their common trade tongue. "But I am far from being a wizard. Just a lowly student of magic." "And who are these 'enemies of your family' who kidnapped you?" asked Helga. "And why would they want you?" "I honestly do not know who they are. I presume it has something to do with politics. My father, Wenthar, is a great chieftan amongst the centaurs of the Glow-Worm Steppes. You Snero might call him a 'king' but we centaurs don't, although he is great among us. As for why they want me, I can only presume it is to put pressure on my father." 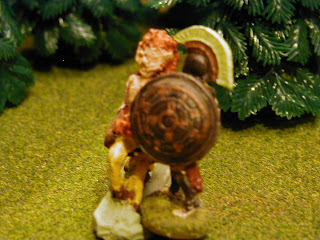 Nikos meanwhile had discarded his small wooden shield and fitted the hoplon to his forearm. "See how well it fits me?" said Nikos as he thrust it in front of Zilwen. Just as he did so there was a sudden gong-like sound as three arrows bounced off the shield. A lyric voice called out something from the edge of the trees in a language most didn't know. To which Zilwen replied in the same tongue, "And why should he move the shield so that you may 'slay the monster'? For I assure thee that I be no monster. Wouldst a monster know the tongue of the Elves?" The voice from the woods called forth again. To which Zilwen replied, "Tis not as you say. Yon deer wast slain to the west, on the open knolls, and not within the confines of this wood. Thou mayst indeed find the deers entrails and blood spoor there . . . and not here." Then, indicating the puzzled faces of the rest of the party, Zilwen said, "But come, Archer, my companions do not ken the Eldish tongue, can you not speak Mergan, which they all know?" "I can, and will. By your speech I deem that the warnings we received of a vile monster, half horse, half ape, do not fit thee." Stepping into view was an elf. "I be Feovass, a warder of Breem. Who here slew the deer? And where didst thou do so?" Jack said, "I did. On a knoll outside the forest. It is a knoll where you can look to the south and see the tower the lighting struck. If you'll stop shooting at us, you can join us and have something to eat, if you like." "Rather you will needs join me. For you have entered the Dark Wood without permission and so you must be taken to Breem, where Cil-Drith will decide your fate." Feovass then said something in his native tongue . . . and a voice from the wood behind them answered in the same language. "Cernalin will backtrack your path and seek to verify your claims. In the meantime we will head to Breem. And, while you won't see them, the rest of my patrol will be pacing us. If you try to escape, you will not leave the Dark Woods alive. Come." Two days later the Feovass, Cernalin and the party arrived at the elven town of Breem, where Cil-Drith would judge them. Clicking on the map to the left will bring up a larger version of it. The red arrow (upper left) shows where the adventure started. The green pentagons show where the major action of various scenes takes place. The number of the scene is on the pentagon. Scene four is indicated in Breem even though that scene has yet to take place. And please be aware that this map is only a very small segment of the way to their ultimate goal. I have not actually had that many Mythic throws . . . and yet on dicing to see if there was an encounter, I got another double (22). Subsequently I got "PC Positive", Nikos, "Block" "Wounds", which is why he found the old bronze hoplon and it blocked the arrow from striking Zilwen when the elf patrol found them. I will try to post a map showing their progress relatively often. The numbers will refer to the scene and the location will be where the primary action of the scene takes place. Note, I've marked Breem for Scene 4 even though the party won't get there until the 19th of Spark. I was just wondering, how long does it take you to "run" one of these episodes? I don't know. I type as I run it . . . but then it takes a lot longer to take and add photos, tweak maps and make finishing notes. In addition I usually don't do it all in one sitting . . . and, finally, I've only done three scenes. Remember, this is my first attempt at using Mythic at all (and I'm not even sure that I'm doing it correctly). However I really DO appreciate comments. Not only does it let me know that some people are reading this, but they often have had useful comments or ideas. I'm following as a novice, taking mental notes. One thing I find not obvious in the reports is how much Mythic you use. Have we witnessed only the highlights of Mythic generation so far or have you really been using it so little? No, I'm not listing every Mythic roll . . . But, that being said, I don't make a lot of rolls. As the Emulator suggests, I use my imagination once a direction is indicated. Also, since the terrain of the world is set, I don't need to query that . . . and, of course, the dialogue comes from me. Now I DO make Mythic rolls and go in the direction they suggest . . . but I am not using it to define everything. I hope that that answers your question. Not had chance to comment before now but I'm enjoying everything so far. It doesn't matter if you don't get the rules absolutely spot on, just enjoy the game that's all. Play whenever you like, and as little or as often as you like, that's my motto. If things get a bit stale or boring, then move on to another game for a while. You'll be suprised how fresh the game will feel when you come back to it. Try not to throw too many doubles.